MUMBAI-BASED Sunil Mantri Realty Ltd (Sunil Mantri) plans to pump in some US$100 million (RM324 million) to participate in the development of Bandar MSC Cyberport in Kulai, the first Multimedia Super Corridor (MSC) cybercity in Johor. Recently, this Indian property developer signed a memorandum of understanding (MoU) with MSC Cyberport Sdn Bhd, a public-private partnership to develop, construct, market and fund Bandar MSC Cyberport. MSC Cyberport chief executive officer Ganesh Kumar Bangah said the Indian company signed the MoU to jointly develop Bandar MSC Cyberport, a RM1.16 billion development within Iskandar Malaysia. "The US$100 million investment from Sunil Mantri will be injected to develop Phase 1 of Bandar MSC Cyberport, covering a size of 13.2ha. Work on the project is expected to start at the end of the year," he told Business Times. Ganesh said this foreign direct investment is significant for the development of Bandar MSC Cyberport as it will give the development international credibility and recognition from Indian multinational companies (MNCs) that are already clients or are familiar with Sunil Mantri's successful developments in India. "This will jump-start foreign information technology (IT) investments in Bandar MSC Cyberport and Iskandar Malaysia," he said. He said Sunil Mantri and MSC Cyberport will cooperate to develop Bandar MSC Cyberport, and does not rule out the possibility of the establishment of a joint-venture company to carry out the project. "We are in the midst of finalising the details of a special purpose vehicle (SPV) to conduct the development and will make the announcement on the set-up of the SPV in due course," he said. Elaborating on Bandar MSC Cyberport, Ganesh said the project is a 60ha information, communication and technology (ICT) city development located in Kulai, within Iskandar Malaysia where the Second Link and the North-South Expressway meet. "It will be a mixed development with residential, commercial and ICT spaces targeting the IT operations of MNCs, while developing local technology companies and technopreneurs. "The cybercity will be ready in phases, starting end of 2008 to 2009," he said. MSC Cyberport was established to create a global ICT business hub, with a world-class living environment for ICT companies worldwide within Iskandar Malaysia. This is in line with the government's MSC Malaysia initiative. Bandar MSC Cyberport is operated and managed by MSC Cyberport Sdn Bhd, 30 per cent-owned associate of Kumpulan Prasarana Rakyat Johor Sdn Bhd, which in turn is a wholly-owned subsidiary of the Johor government. The cybercity at present covers two designated locations, namely Menara MSC Cyberport and Bandar MSC Cyberport. It is envisioned that these two hubs will serve as a vehicle to initiate and facilitate the growth of ICT and knowledge-based industries in Johor. It is based on the hub and spoke concept, each having its own unique strength and cost-effective base for ICT companies targeting emerging markets in the Asia-Pacific region. 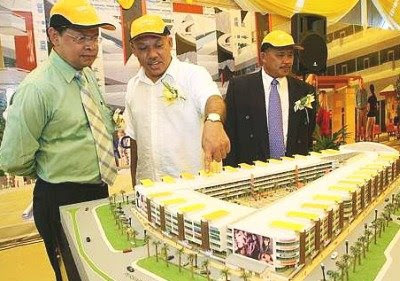 Raja Mohd Azmi Raja Razali (centre) showing a model of Space U8 to Bank Kerjasama Rakyat Malaysia managing director Datuk Kamaruzaman Che Mat (left) and Shah Alam Mayor, Mazalan Md Noor at the project launch recently. DEVELOPERS love to coin new words, especially for concepts that are new, exciting and marketable. The word condotel (a mix of condominium and hotel) was the craze in the early 1990s. Then the term vanished as sudden as it appeared. Soho (small office, home office) is still in vogue today while we are hearing less of the city-within-a-city concept. Last week, Mainstay Development Sdn Bhd, a subsidiary of Mainstay Holdings Sdn Bhd, has called its maiden flagship commercial development, Space U8 in Shah Alam, a Sumo or shop unit, mall office. Some reporters attending the official launch of Space U8 at the project site (1.5km from Giant Shah Alam and near TTDI Jaya) on May 26 were baffled by the term. Mainstay Development executive chairman Raja Mohd Azmi Raja Razali explained that Sumo is built on a hybrid concept of dual frontage, featuring shop offices on the outer frontage with an inner facade of a retail outlet. Like a mall, it will be a place for people to meet. Space U8, with a gross development value of RM220mil, will have a 70,000 sq ft central courtyard where events such as the screening of movies on a giant screen, weekend markets and celebrations could be held. “We believe it's the first concept of its kind in Selangor, but people may call it differently. We have received about 50% bookings for the shop office units,” he said. He is confident that the units would be quickly taken up. Some new shop office developments in the Klang Valley like Glomac's Plaza Glomac in Kelana Jaya (which also has a dual frontage and a big centre court), and I-Bhd's CityPark shop offices (hi-tech and linked to the City Walk pedestrian mall) also have a kind of mall concept. A potential problem of this kind of open mall is that it might attract the wrong crowd –youths might lepak (hang around) and become a nuisance. It is thus important that the property must have proper management and security. In this respect, Space U8 will have 24-hour security with CCTV facilities as well as ample parking space with 1,500 bays. Scheduled to open first quarter of 2010, Space U8 (named after its location in Section U8, Bukit Jelutong) will comprise 58 units of freehold, stratified four-storey shop offices on an almost triangular-shaped 8.39-acre site. Intermediate units measure 25ft x 90ft with total built-up area of 9,000 sq ft while end and corner units vary from 10,000 to 12,000 sq ft. The average price is RM330 per sq ft. There will be 46 intermediate, eight end and four corner units. Shop units on the ground level will have a five-metre high ceiling with other units at 3.2m. There will be a four-storey building with 84,000 sq ft for an anchor tenant. The project is scheduled for completion in December 2009. Raja Azmi (previously chief executive officer of Fly Asian Xpress Sdn Bhd, now renamed Air Asia X) said the company's vision was to make Space U8 the shopping haven and corporate address in Shah Alam. He added that businesses and investors would find much appeal in Space U8's location, as there was a population of more than 580,000 spanning Bukit Jelutong, TTDI Jaya, TUDM Subang and Shah Alam. The company is targeting new start-ups and medium-sized companies as potential tenants, offering them a suburban address with easy accessibility and less traffic congestion. The project is linked to highways like Guthrie Corridor Expressway and the New Klang Valley Expressway. A hypermarket, private college, and food and beverage operators have enquired about leasing in the project. By providing the funding, Bank Kerjasama Rakyat Malaysia Bhd is also lending confidence and credibility to the development. A NUMBER of property projects in Penang, especially those on reclaimed land of the island and township developments by state agencies, can look forward to higher property value if the land tenure of these projects is converted to freehold from their current leasehold status. According to Real Estate and Housing Developers Association Penang chairman Datuk Jerry Chan, while most privately owned pieces of land are on freehold status, projects on state reclaimed land are mostly on leasehold land. Townships undertaken by state agencies in Bayan Baru and Seberang Jaya and commercial projects such as Komtar are also on leasehold basis. “The initiative to allow the conversion of leasehold residential land to freehold status is certainly welcomed as it will add value to leasehold property and development projects in the state. “It is a timely exercise to raise Penang's profile and attraction as a real estate destination,” Chan said. The projects that stand to benefit include IJM Properties Sdn Bhd's 350 acres of reclaimed coastal land along the Jelutong Expressway, which has a potential gross development value of RM6.5bil. Under a privatisation exercise in 1997 to build the Jelutong Expressway, IJM was granted the right to reclaim the land for property development. Development plans for an integrated waterfront township called The Light will comprise residential, entertainment, business, education and commercial components. Under phase one, six parcels of high-end residences will be developed over 17ha comprising 1,186 units. It is scheduled for completion in three to five years. Phase two will comprise a commercial and retail centre on 41.68ha while phase three would be developed into a 2.8ha seafront park. Previously, there were also other sizeable leasehold property developments in the state that have been converted to freehold status. In October 2005, the former Penang state government allowed the 73-acre Queensbay land to be converted from leasehold to freehold. The Queensbay project, which was located on reclaimed land, was jointly developed by the state and a private developer. When the original developer was unable to continue with the project, the state government in a kind gesture granted the conversion of the freehold titles to the buyers as “compensation in kind”, as the developer (the state is also a partner) was unable to pay the liquidated damages. The CP group was invited by Bayan Bay Development Bhd to be the “white knight” to revive the project. Work started in 2005 and the project is scheduled for completion in 2013. 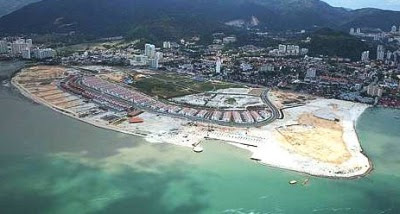 The entire integrated seafront township in the southwestern seaboard of Penang island will have a gross development value of RM1.5bil. In 2006, E&O Property Development Bhd also managed to convert its Seri Tanjung Pinang reclaimed land in Tanjong Tokong to freehold status. Seri Tanjung Pinang, with an estimated gross development value of RM2bil, is a key earnings driver for E&O. With the 605 acres and rights to reclaim a further 740 acres, the company is one of the largest developers in Penang now. PROPERTY consultants and developers agree it is time to review the country's leasehold land concept to keep up with the changing needs and overhaul Malaysia's land tenure system. They concur that such an initiative would benefit individual property owners as well the respective state governments through conversion premium income. “While owners of individual leasehold property face a steady erosion in the value of their property over time, state governments are sitting on essentially a goldmine which could easily be unlocked by returning the freehold rights to the leaseholders,” Regroup Associates executive chairman Christopher Boyd told StarBiz. He said it was timely for the Federal Government to take the lead to come out with a Leasehold Reform Act that would enable leaseholders to buy the freehold interest based on a certain premium formula. “Both the Federal and state authorities should realise that there is no point in holding on to their freehold reversions. An orderly and transparent system for selling the freehold rights to the respective leaseholders would be a wise and popular move. “The whole leasehold concept is an anachronism and has outlived its usefulness. It's a legacy from the old British system and Britain has also went on to review the leasehold concept that resulted in the Leasehold Enfranchisement Act (1963), giving leaseholders the right to buy up their freehold interest. “It is long overdue in Malaysia and a review is certainly in order,” Boyd said. He said the Penang state government's initiative to encourage residential leasehold landowners to have their land converted to freehold status would have a far-reaching impact on the property market if it was adopted by the other states. Penang chief minister Lim Guan Eng had recently urged leasehold landowners to apply to the state government to convert government land into freehold status with a premium payment. The new land policy would allow 30-year, 60-year or 99-year residential leasehold land to be converted into freehold land on a case-by-case basis. The state is also looking at allowing the tenure of leasehold industrial land owned by the state government to be extended from 60 years to 99 years. “It is a very far-sighted policy that will encourage a long-term mindset in terms of development plans by developers and enhance the attraction of Penang as a real estate investment venue. “Leaseholders will substantially enhance the value of their properties, and when renovating or improving their properties, they can take a long-term view,” Boyd said. He said the land premium price to convert leasehold to freehold status had to be based on a fair formula, taking into account the difference between the freehold land price and the property's current market price. Real Estate and Housing Developers Association (Rehda) president Ng Seing Liong concurred that the initiative was a positive development for the people as well as the property sector and urged other state governments to look into adopting it. Rehda Penang chairman Datuk Jerry Chan said land and property value could easily appreciate by 25% to 30%, and property projects would be more marketable and attractive to investors. “The onus is on the state government to disclose the quantum of premium to be paid based on a fair formula for leaseholders,” he said. Mah Sing Group Bhd president and group chief executive Datuk Sri Leong Hoy Kum said converting leasehold land to freehold status would certainly enhance the value of the development, depending on the location of the property. If it is in the heart of the city and at a very strategic location, the appreciation in value could reach 100% to 300%. “There will be a two-fold benefit to the owners – they do not have to face the hassle of renewing the leases, and they may enjoy a windfall should they decide to sell the land or property later. Bank financing for freehold property will also be easier to come by compared with property with less than 40 years’ lease. “Besides enhancing the appeal of the development for local buyers, this will also encourage foreign buyers to participate more actively in the property market,” Leong said. “Developers who may have been hesitant to develop land with short lifespan left on their leases will have a new avenue to explore business opportunities. This will be a stimulus to boost the property market as there will be more land transactions,” Leong said. TRINITY Towers Sdn Bhd is optimistic that the bungalows at its PT19 Residency development in Bandar Bukit Puchong will be fully taken up by August. The development, comprising 24 units of three-storey garden villa bungalow, has achieved a 40% take up since its launch in March, said managing director Datuk Neoh Soo Keat. “We have had buyers from Subang, Petaling Jaya, Bangi and within Puchong itself,” Neoh told StarBiz. Located on two acres of 99-year leasehold land, the PT19 Residency project has a gross development value of RM20mil and is expected to be completed in 18 months. The guarded and gated enclave would have round-the-clock CCTV surveillance and lush greenery surrounding the development. The garden villas come in two types, comprising built-up areas of 3,529 sq ft and 3,588 sq ft with price tags ranging from RM848,000 to 877,000. With readily available infrastructure and amenities, residents could enjoy the value of the development the moment they moved in, said Neoh. “PT19 Residence is five minutes' away from shopping complexes like Giant, Tesco and Jusco. It is also directly connected to the NKVE and Kesas highway,” he added. Neoh said people were impressed with the designs of the garden villas. “Many people think Puchong is a very conventional area. Our designs are anything but conventional,” he said. PT Residency is the second project by Trinity Towers. Its first, a high-rise condominium, The Heron Residency, was launched in 2005 and has been fully taken up. “Our Heron Residency project is located just next to PT19 and the value of the property has appreciated about 30% since its launch,” said Neoh. “We expect the value of our PT19 project to achieve an appreciation of up to 35% in three years,” he added. Trinity Tower’s next project is a mixed development, Bandar Kinrara 9, situated near Bukit Jalil. “We hope to launch that project in August,” said Neoh. RAPID economic development coupled with increased urbanisation in Penang has led to a significant growth in the number of vehicles using the road network. On Penang island, this has placed considerable strain on the existing urban transport infrastructure, leading to worsening traffic congestion, increased parking problems and environmental degradation. The Malaysian Resources Corp Bhd (MRCB)-led consortium's monorail proposal for Penang covers densely populated areas such as George Town, Air Hitam, Pulau Tikus and Komtar, to name a few, and the industrial areas. The plan also provides proposed monorail stations with environmentally clean and efficient feeder bus services. It will also be easy for the disabled to use. "Among the features, are a lift with Braille buttons, blind person guides (via studded floors) leading to the station platform and two wheelchair spaces in each monorail vehicle," said Scomi Engineering Bhd president Hilmy Zaini Zainal. Each station will boast elevators and a train floor at platform height that meets International Disability Act standards. The trains will also have a wheel chair area. Hilmy said foundation works are in progress and the pre-cast beams can be constructed simultaneously at the casting yard and launched at site when columns are ready. "In fact, a considerable amount of site work will be done during the night to mitigate disruption to normal traffic during the day." The MRCB-led consortium, which includes Scomi Engineering Bhd and Penang Port Sdn Bhd, has been given a letter of intent by the government for the job. The consortium beat three other bidders for the project and submitted its bid in November last year. The other three bidders for the monorail were MMC Bhd, the then Road Builder (M) Holdings Bhd, which has since been taken over by IJM Corp Bhd, and the Melewar Group.